Free rental for all school year, only need to identify as Orchestra student from Peninsula deposit two amounts: $25 for cleaning which will be returned if student returns tuxedo cleaned with receipt from dry cleaners. 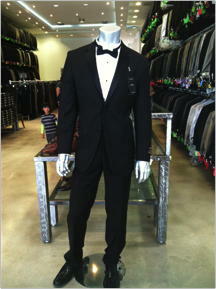 Additional required deposit can range from $125 to $250 depending on quality of the suit. Both amounts should be on a check payable to the Costume Closet - the check will not be cashed and will be returned when the items are received back at the Costume Closet and proof of dry cleaning is provided. Wisteria: Classic gown features a short sleeve chiffon overlay split down the front to let the charmeuse shine through. Washable.